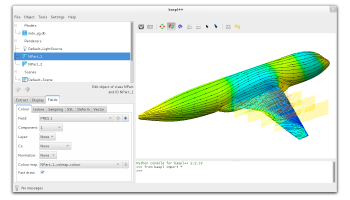 baspl++ is a viewer and post-processing framework for finite element and finite volume analysis results. 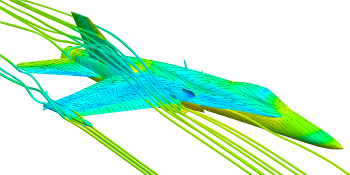 It is specifically designed for multi-physics applications involving B2000++ FE models and unstructured and structured multi-block CFD models. Models can be viewed during simulation runs, and simultaneous visualization of several models is supported. Three kinds of licenses are available: Small (up to three machines/computing nodes), workgroup (up to 10) and site (unlimited). Please refer to the System Requirements page for information on distributions, available platforms, and computer system requirements. Several, powerful methods for the visualization of results from Euler and Reynolds-Averaged Navier-Stokes (RANS) simulations are available. 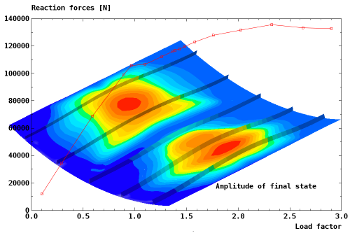 Surface streamlines are used to visualize the skin friction field in RANS simulations or any first-order tensor field that is defined on a surface, be it the skin, a cut through the volume, or an iso-surface. The placement of the seeding points and detection of the streamline endpoints is fully automatic and optimized to give visually pleasing results. 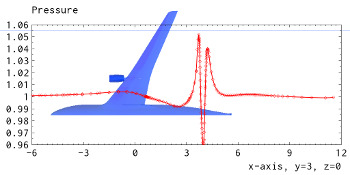 3D particle traces help to understand the flow field (steady and unsteady). A set of emitter grids can be positioned interactively or via the scripting interface. Several cutting planes can be defined. The cut can be restricted to the skin or other subsets of the model. Like for the iso-surface extraction method, any field variable can be visualized on the extracted surfaces. Any extraction can be restricted to a rectangular box and to a range of values of a field variable. An extension to baspl++ to create typical CFD graphs, such as 'Profile' plots, 'Line' plots, and integrated aerodynamic coefficients plots. The CFD XY plot tools can handle structured multi-block finite volume grids and unstructured multi-block finite element grids. The CFD XY plot tools can be operated interactively or with scripts, and scripts can be generated automatically from sessions. CFDtools works seamlessly with all other baspl++ viewing functions. Objects that were created with the GUI can be assigned to Python variables. For each control element in the GUI there is a Python counterpart. When placing the mouse pointer over a control element, a tooltip appears with the explanation of the control element's function and the Python syntax. All commands that are entered via the Python command line become immediately visible in the GUI. The commands to reproduce the current state can be recorded in a Python script. These automatically generated scripts are concise, do not contain any superfluous commands, and are therefore easy to read and to customize. The NSMB (Navier-Stokes Multi-Block) flow solver is fully supported. The coordinates can be displaced to the cell centers, useful for displaying graded colours and iso-lines. The boundary (skin, far field, etc.) can be extracted according to a range of boundary codes. And the so-called ijk-extraction permits the extraction of (topological) planes which is useful for manual inspection of block-structured grids. Selective extraction (element sets, face sets, edge sets). Extraction by group or material ID. Support for verification of FE models, such as the display of boundary conditions and material directions. 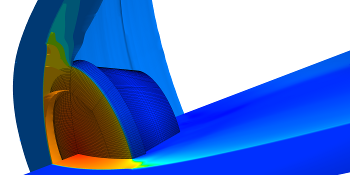 Display any scalar variable as contours or iso-lines on the extracted surface(s). Display deformed meshes and vector fields. Display of stress and gradient data computed at the integration points. For stress and strain tensors, the eigenvalues and -vectors can be displayed. Filtering according to layer number is supported. Extensive possibilities for XY-plotting of history data, with the possibility to compare results from several analysis databases. Easy-to-use wizard for free-vibration analysis and linearized pre-buckling analysis. baspl++ is compatible with B2000++ and with the NSMB flow solver. It imports Tecplot ® data files and NASTRAN Bulk Data Deck files, DLR TAU files, and Edge files.